What's the career progression like in commercial cookery? Home > News & Events > Blog > What’s the career progression like in commercial cookery? Here in Australia, we're so lucky to have an incredible industry for chefs to flourish in. From celebrities to head chefs of world-renowned Australian restaurants, countless people have already risen to greatness through their culinary career. Prestige doesn't happen overnight, however. As the most successful executive chefs can tell you, there's a ladder that must be climbed. The great news is that with so many opportunities available in Australia's hospitality industry, highly motivated chefs have the potential to grow their career rapidly. Let's take a look at the different culinary roles found in commercial kitchens, and how your career can progress from one to the other. What is the brigade de cuisine? The brigade de cuisine, or kitchen brigade, is an organisational hierarchy for commercial kitchens, designed and codified by Georges-Auguste Escoffier. Often considered the father of French haute cuisine, Escoffier began to challenge the then-traditional kitchen systems even as an apprentice. Having served in the French army, Escoffier applied his experience with military hierarchy to his organisation of the kitchen. As a result, Escoffier's system relies on a strict chain of command and delegation of tasks to maximise efficiency. Each person in the kitchen is responsible for a specific station or task, and reports directly to the position above them. Different variations on the kitchen brigade can be found throughout the industry, according to the size and needs of the kitchen. Median wage: $21.27 per hour (according to PayScale). A recent graduate from a commercial cookery qualification is most likely to find their first role as a commis (pronounced "commy") chef or line cook. This is a junior position, typically delegated to a specific station and reporting to a chef de partie. 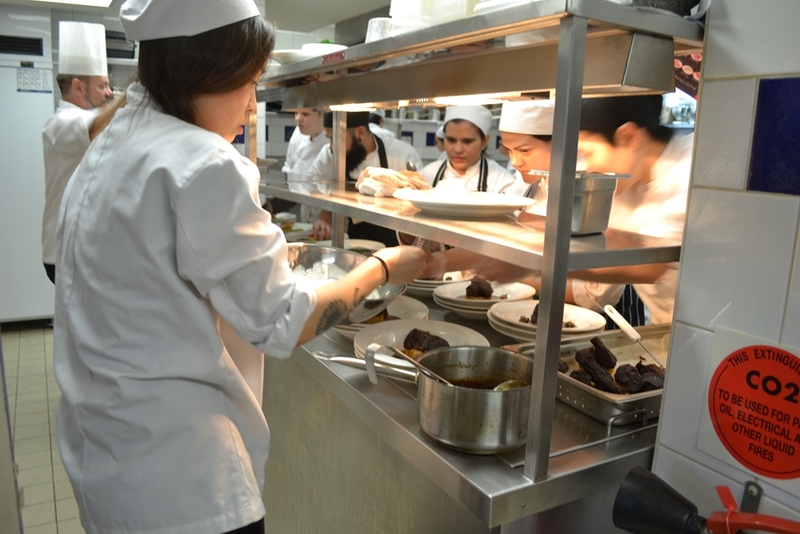 Commis chefs may move around the kitchen throughout their employment, as the needs of the kitchen change. This allows them to gain experience throughout different specialisations – such as seafood, sauce, or pastry. As this experience builds, a commis chef may be able to move up to the position of first commis or demi-chef de partie, training to transition into a full chef de partie role. Median salary: $53k (according to PayScale). While a chef de partie will be skilled in areas throughout the kitchen, there will be one particular station they specialise in and are therefore in charge of. A chef de partie may have a more particular title according to their station, like saucier (for sauce) or entremetier (for entrees). As a station leader, a chef de partie has greater responsibilities, overseeing the production of dishes in their station. The chef de partie may also be responsible for training commis chefs, ensuring food is consistent across each plate and guaranteeing health and safety compliance at their station. Median salary: $57k (according to PayScale). The sous, or "under", chef is typically second-in-command to a head or executive chef. Not confined to any station, a sous chef oversees the whole kitchen and acts as an intermediary between each station and the head chef. As such, they need to not only be an experienced and talented chef, but a strong leader with excellent communication skills. Additional sous chef responsibilities tend to include managing inventory, preparing and designing menus in tandem with the head chef and ensuring staff are adequately trained. Median salary: $62k (according to PayScale). Otherwise known as the head chef, the chef de cuisine is often the highest position in a restaurant kitchen. Head chefs will have largely supervisory roles, with responsibilities far beyond food preparation. These will often include liaising with other areas of the establishment, such as front of house. They will usually report directly to the restaurant manager or owner and play a major role in the continuing operation of the business, maximising kitchen profitability. Median salary: $80k (according to PayScale). While executive chef is occasionally used interchangeably with head chef, this title most commonly refers to a specific role only found within especially large organisations. Executive chefs will usually be found in hotels or restaurant groups, overseeing multiple venues. As a business-focused role, the executive chef acts as a manager across different venues, ensuring consistent excellence and coordinating marketing and public relations efforts. Many Kenvale industry partners employ an executive chef. For example, Merivale promoted Dan Hong from his position leading Cantonese style restaurant Mr. Wong to the role of executive chef of the wider Establishment portfolio in August 2018. Likewise, Will Stewart and Steve Flood of "My Kitchen Rules" fame were appointed executive chefs at the Farmer and the Butcher earlier in the same year. Kenvale commercial cookery students will engage with the kitchen brigade system up close, working as commis chefs in the kitchens of many of our well-respected industry partners. At the end of their degree, many graduates may stay and move up the ladder in trending venues such as Establishment, Seagrass and the Farmer and the Butcher. Restaurants will have a limited number of staff, and therefore progression may not always be possible within your current workplace. The good news is that the hospitality industry is thriving in Australia. With a 16.7 per cent job growth projected for chefs in Australia in the next five years (according to SEEK), career progression is easy for self-motivated, qualified chefs. Your culinary career begins with gaining real skills. Here at Kenvale, we're dedicated to equipping you with the skillset needed not only to function in a commercial kitchen, but to grab the reins of your career and see your dreams become a reality. 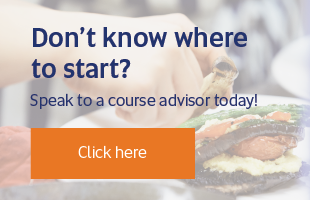 So don't wait – reach out to a course advisor today to find the best qualification to drive your goals. What’s it really like to work as a chef in Australia? 4 Australian chefs who have achieved career success Career paths and valuable life skills in hospitality Are you better suited to a front or back of house role?